This recipe is absolutely wonderful! Perfect flavor, texture and always a hit! The apples are cooked to perfection with the perfect crunchy topping. With all this chilly weather, I love food that just warms you up and puts a smile on your face. 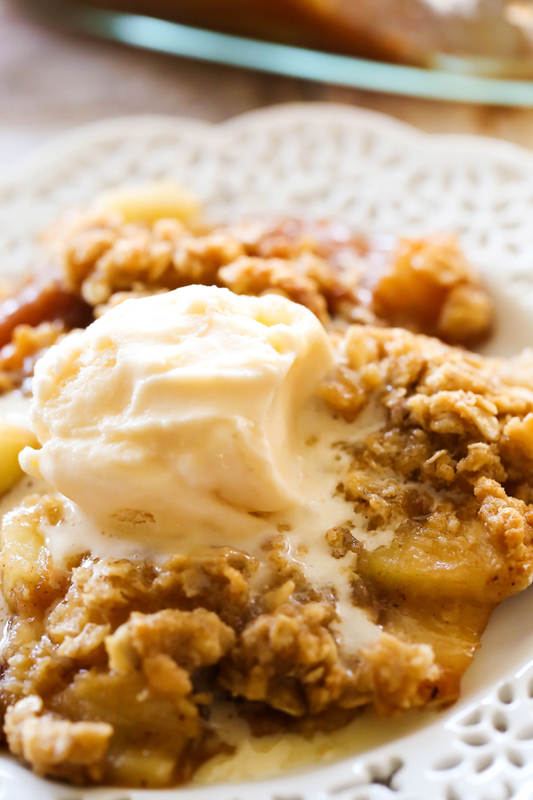 Apple Crisp is a favorite of mine this time of year. This recipe is perfection. Perfectly cooked apples. Perfectly crunchy topping. Perfect mouthful. Each and every time. This is a very simple recipe and is a delight to eat. Top with some ice cream and let it melt over the top to create an amazing and unforgettable bite. Spray an 8"x8" baking dish with cooking spray. In a large bowl combine apples, lemon juice, orange juice, sugar, cinnamon, nutmeg and cloves. Toss until all the apples are well coated. Toss the butter and the flour with the apple mixture. Pour into the baking dish. In a medium mixing bowl, combine butter, oats, flour and brown sugar. Cut the butter into the other ingredients until you have a crumbly mixture. 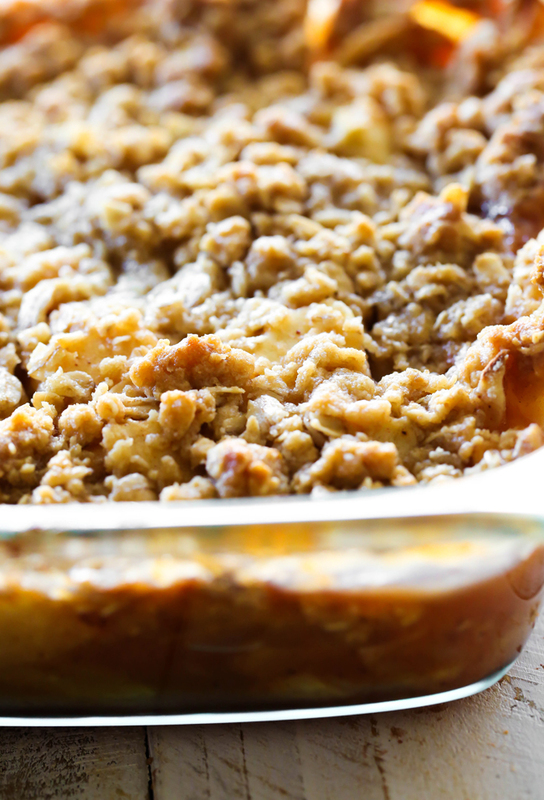 Spread crumb topping over the apples and bake at 375 degrees F for 35 minutes or until the apples are tender. Looks so good! Especially with ice cream! Where in the recipe does it say to add water? Okay no where in this recipe does it call for water. So not sure what the heck you were reading. Made this tonight and I have to say thank you for an awesome recipe for apple crisp. Put it together before dinner and enjoyed it 40 minutes later. Rave reviews. Definitely a keeper for my collection. Thank you for a wonderful apple crisp recipe. Easy to put together and absolutely fantastic. Definitely a keeper. Will be making often. Made this last night and it was aaaaamazing. Didn't have any ice cream, instead, I drizzled a little heavy cream on top and it was glorious. Highly, highly recommend this recipe. Loved this! I especially loved the topping. It wasn't too sweet and I used old fashioned oats to give it a little more texture. This is going into my "heirloom" recipes. Can I sub out pears for the apples? I have a ton! Can make and keep it a day before?? How can I reheat it before serving? As a country gal, I made this and did not have ice cream, whipping cream, or heavy cream. I had to top with Cool Whip, but it was yummy anyway! I'll make it again! Thanks for the recipe. Would it be ok to leave out the orange juice? I just made this and my goodness I am in heaven. It was so delicious. Thank you so much for this recipe!